Hamiltonian is pleased to present, "DIY Laser Eye Surgery", a solo presentation of painting, sculpture and video by artist Rives Wiley. "DIY Laser Eye Surgery" will run from May 20 - June 24, 2017, opening with a reception on Saturday, May 20 from 7 - 9 pm. The artist will be in attendance. 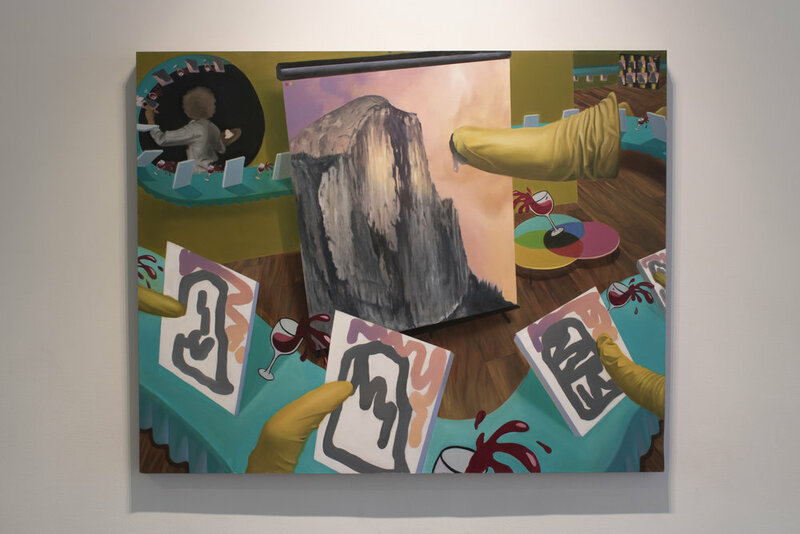 In "DIY Laser Eye Surgery", painter and video artist Rives Wiley invites viewers to step inside her perception-altering, handmade interpretation of the internet. Sourcing from digital imagery of lens flares, heavily photoshopped sunsets, snapshots of social gatherings and screen-saver graphics, Wiley immerses her viewers into spaces where reality and their virtual counterparts mirror and mimic one another in an endless feedback loop. At turns playful and anxiety-inducing, Wiley prompts viewers to question the nature of virtual reality and the consider whether life is merely reflected in the digital realm, or if the digital dictates us. Wiley's skill in blurring boundaries between the physical and the virtual reaches its apex in her trompe l'oeil installation "DIY Laser Eye Surgery". An homage to the cult of YouTube do-it-yourself culture, Wiley's oil-painted diorama employs one-point perspective, video and sculpture to uncanny ends, creating an unsettlingly real-looking screen in which a disembodied voice cheerfully guides viewers through an absurd tutorial on how to use lasers, a razor blade, food coloring and petroleum jelly in order alter one's vision so as to see in digital effects. Rives Wiley (b. 1990, Alexandria, VA) holds a BFA from Rhode Island School of Design (2013). A 2016 Hamiltonian Fellow, her work has been featured in publications including Vice: The Creator's Project, The Huffington Post, Washington City Paper, Dirt DMV, ARte Fuse and Bmore Art. Her work has been exhibited in several group and solo presentations including "Failed Evolution", SPRING/BREAK Art Fair, New York, NY (2017); Satellite Art Fair, Miami Beach, FL (2016); "new. now. 2016", Hamiltonian Gallery, Washington, DC (2016); "Dinner Party Download", Hillyer Art Space, Washington, DC (2016) and "Inter/Mission", The Pataphysical Society, Portland, OR (2016). She lives and works in Washington, DC.